Cambodia’s geography is favorable for all types of plants, such as vegetables, grass, vines, big trees, or fruit trees… etc. These plants, especially fruit trees grow and give good yields in all regions including coastal, plateau, or low land. There are many types of fruit trees our women and men love to plant in the nearby village or on the big farm. The fruit produce is taken to and sold at the market by our women and men and sometimes they have difficulty to keep the surpluses. To save these surpluses, some women and men use them to make other products for future use. For example, they keep them in the salt to make pickles to eat with rice or slice them and dry them for use after the fruit season; make jams for eating in months to come. A lot of produce can be made good jams too, for example vegetables like gourds, pumpkins, papayas and rhizomes plants like cassavas, gingers, ground beans and plants whose trunks are vine like sleuk bass, bandol pich and water crops like lotus seeds or fruits like gooseberries, jujubes, mangoes, oranges, bananas, coconuts, tamarinds etc. Some families make jam for internal use and some sell them to earn an addition income. Knowing how to make jam gives us a lot of advantages, for instance we know how to make things out of the produce by not leaving them rotten or damaged; we gain knowledge and skill that serve our living and play a part in the life skill and domestic chores that equip the boys and girls with experiences for them to undertake during and after their study. Having seen its qualification, the committee has prepared this document aiming to promote the male and female farmers’ agricultural products and to enhance the effective saving and creativity of the domestic products of good quality for the social use and demand and for aiding the family living and wellbeing. 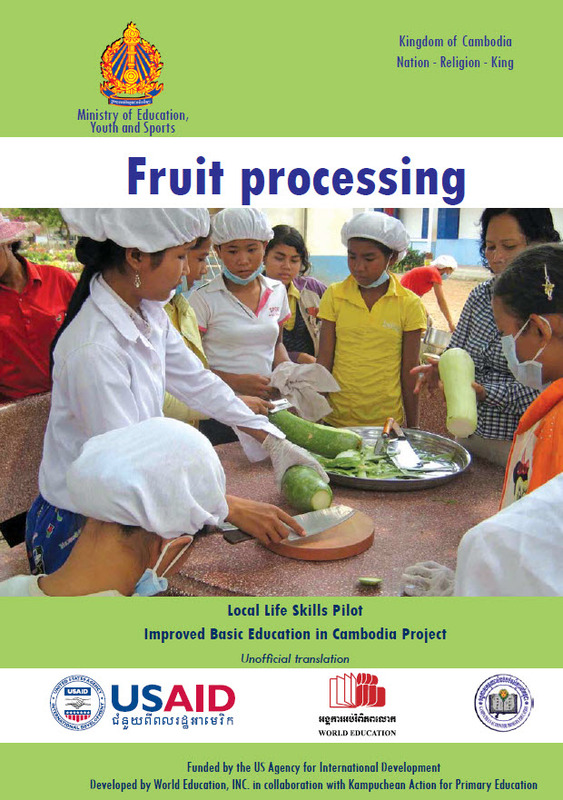 During the activities in this manual, it is advised to use the help of community members. They can assist in teaching, overlooking the cooking activities and supply the necessary material.